My friend and I won the opportunity to be the Artists in Residence at Lipscomb University for a summer. Together we created a board game with an app to act as game master through out the game. Here are some pictures of the final product. 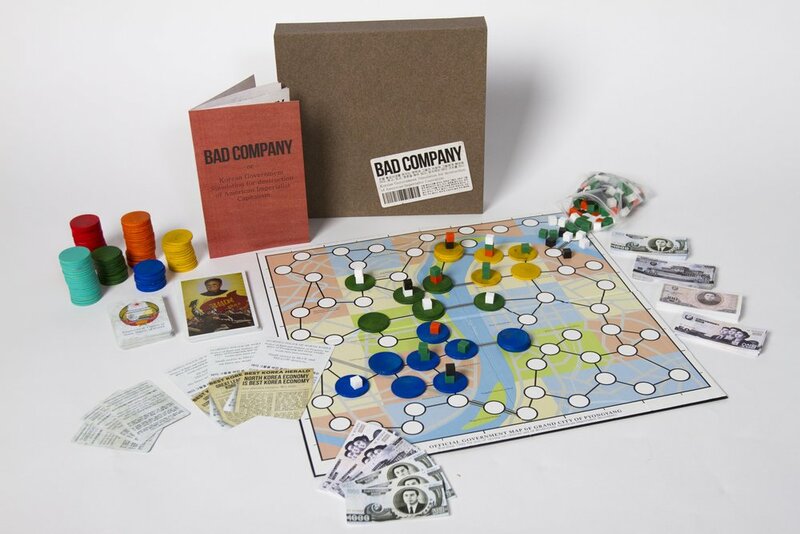 The game was based off the concept off each player being an American business that is trying to smuggle illegal American goods into North Korea. Each player buys and sells their goods and stores them in their warehouses for a complete round of turns. The more goods they sell at once the higher the profit. However the Korean government is looking for your illegal warehouses and a raid can happen at any moment. We used real North Korea propaganda art through out the design process. Below is the GUI for the game the we created, the players would be declaring their moves on the app and passing the phone from one player to the next. The final screen shows the action of the previous player and then allows the next player to start their turn. They players buy and sell their illegal goods and place their storefronts down the the map. Raids from the Korean Government allows an element of luck in the game.